Megan Fox has reportedly shrunk down to less than a size 0, after wanting to lose her famous curves in order to be taken seriously as an actress. The ex-Transformers star, who caused concern last summer after looking “extremely thin” at the premiere of her film, Jonah Hex, is apparently “desperate” to slim down further, so much so, that she has become a fan of fad dieting. 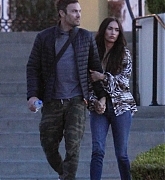 The magazine also claims that the 24-year old’s hubby, Brian Austin Green, is “worried she’s taking things too far”, especially as they have reportedly been trying to start a family since their wedding last year.